Svante Myrick '09 on the Ithaca Commons during his mayoral campaign. 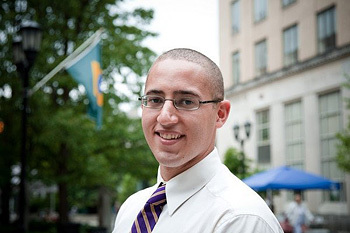 Ezra Update caught up with Svante Myrick '09, who on Nov. 8 was elected the city of Ithaca's next mayor. When Myrick takes office Jan. 1 at age 24, he will be Ithaca's youngest mayor ever and its first African-American mayor. As a Cornell student, Myrick was elected to Ithaca's Common Council as an alderman for the city's Fourth Ward. Cornell President David Skorton congratulated you on your win and wished you well, noting that "our success at Cornell is intimately intertwined with that of the city of Ithaca." How true have you found that to be? President Skorton is absolutely right; the university can't be successful unless the city is successful. And, similarly, if the city is going to thrive, the university has to be a large part of that success. From your experiences during four years on the Common Council, how is the relationship between the city and the university? Myrick talks with Ithaca residents on the Ithaca Commons during his mayoral campaign. Any university town has its town-gown issues. But I think the city and the university have had a fairly good relationship. There is, of course, always room for improvement. I feel that the university doesn't contribute its fair share to the property tax base because of its tax-exempt status. But I think in large part, we have a history of working well together, cooperating on projects, particularly capital improvements here in the city. I've seen the university administration being very willing to work with elected leaders in the city and with members of the community. You knocked on a lot of doors during the campaign in every area of the city -- and you ended up winning in every district. What did Ithaca residents tell you were their top concerns? Number one is the high cost of living. High rent, high property taxes -- staying in the city is pricing a lot of people out of their homes. Another is that people want to protect the beautiful neighborhoods we have here; they want to make sure that those neighborhoods persist and maintain their character. You were a student in the College of Agriculture and Life Sciences and majored in communication. Was this a good choice, and has it prepared you well for a career in public service and elected office? 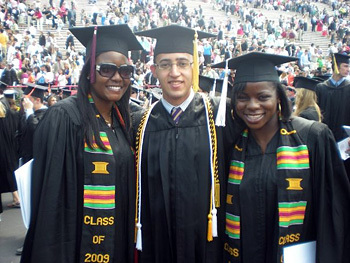 Myrick with Tomi Seriki '09, left, and Janice Nsor '09, right, at his 2009 Cornell graduation. Oh, absolutely. Not just for the campaign but for actual governance. Learning how you can effectively communicate with people is a large part of what government has to do. How to get input, how to seek feedback, how to inform our citizens of major city events or decisions. At Cornell I learned the principles of effective communication and it has served me well so far. You will come into office at a fiscally challenging time, in a state that is struggling with a slow recovery from the recession. You have led programs that target underserved youth -- often just the types of programs cut when budgets are tight. How will you approach these challenges? The largest mistake we can make would be cutting these services at this time. This is a time when young people, more than ever, need to be invested in. And we need to view this as what it is -- an investment. Every dollar we don't spend on youth services now, every dollar we cut now, is going to truly cost us down the road, the cost of needed mediations like jail cells and prison guards -- but also the opportunity cost: the cost in lost productivity, in young people who could have become productive, successful members of society. 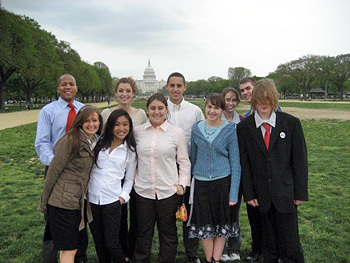 Myrick, center, in Washington, D.C. in 2007 with members of the anti-tobacco advocacy youth group Reality Check. Myrick, who was assistant director of the program, traveled there with Gayraud Townsend '05 (far left) to gain support of representatives and senators in an effort to remove depictions of smoking from movies. What should be done about the fact that so many college students, especially the best and brightest at top universities, choose career paths that take them into the financial sector rather than, say, solving some of the world's most intractable problems through science and research or public service careers? The problem is misaligned incentives. All the incentives in the world right now push people toward working at these investment banks and startups, and I think that will continue to happen as long as people continue to graduate $100,000 in debt. What Cornell has begun to do, by increasing financial aid to needy students, is a great first step. Another is by continuing to invest in the Cornell Public Service Center and other programs that develop public servants. I started in the Cornell Public Service Center myself. And that work is absolutely crucial. What have you learned about the Cornell alumni community through your work for Cornell's Division of Alumni Affairs and Development? They're extremely engaged. They care deeply about their alma mater, they want to have a say in its future, and they're as talented and as bright as you'd expect. Any group of Cornellians, and there are 200,000 of them out there, they really bleed Big Red. How many of the "161 things to do before you leave Cornell" did you accomplish? 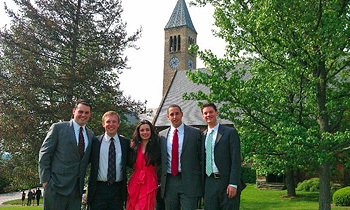 Myrick on Ho Plaza with friends after performing a marriage ceremony for fellow alumni Greg Schvey '09 and Johanna Slotnick '08 in Sage Chapel. From left, C.J. Slicklen '09, Corey Earle '07, Rolena Richardson '09, Myrick and Ryan Lavin '09. I don't think I got to all 161, but then again, I haven't left Ithaca yet. So hopefully I'll get to them before my time here is up. Maybe we should call them "161 things to do before you leave Ithaca." What is your best Cornell memory? I think my best memories happened in the Public Service Center. There were moments when I looked around the room at 20 other students -- juniors, sophomores, seniors -- all who were leaders of different service organizations, and all who cared about the community, not just on campus, but also the community outside of campus. Those were some of my favorite moments, the ones that stood out to me. They gave me hope and optimism.